My buddy Jason Adams of My New Plaid Pants, the funniest and most Fassbender Friendly general entertainment blog on the Internet, interviewed Michael Fassbender back in October while he was attending the New York Film Festival. I'm proud to highlight this nice interview here at FF. Please read the interview in its entirety at MNPP. "Did I really just write that headline? I did! The world just works sometimes. 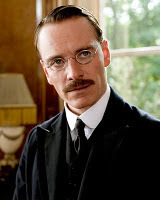 Okay, so first things first: When I sat down with Michael Fassbender to talk about his role as famed psychoanalyst Carl Jung in David Cronenberg's A Dangerous Method a few weeks ago, there was one thing I had to know. One vital piece of information that'd make most everything clear. Thankfully, this being Michael Fassbender, he was plenty willing to share. (He's the sharing type, in case you hadn't noticed.)"... read the rest at MNPP. Aww shucks thanks for the post, Simone! I almost didn't want to post the interview at all because it was like letting it go. Now it's out there and I have nothing! Nothing! Haha, I loved the interview. Jason kept it together, which couldn't have been easy. lol Great job!